The University of Kentucky is currently revamping its general education requirements and as part of this, we have developed a new course, i.e., "iWorlds: Global Information Geographies". It covers a broad overview of information technology related issues but is particularly focused on the ways that technologies are helping to transform places and our use of location. It should come as no surprise that we're taking many of the ideas and research that we've developed here and taking them into the classroom. Hopefully with good results. In any case, the course was unusual enough that it has been featured in the University of Kentucky student newspaper. If any one would care to see the syllabus, shoot me an email. I'm also very open for suggestions for topics/approaches for future versions of this course and/or other classes in a similar vein. UPDATE: A story about the class also appeared in UK Know. Just a fun map of the first autocomplete guess you get when you type a state name in google. As those of you who frequent the blog know, we're mostly interested in mapping and analyzing user-generated geographic information in the aggregate -- whether it be all the Google Maps references to a particular keyword or the number of geotagged Wikipedia articles within a certain country. From time to time, however, we like to talk about other interesting applications of web 2.0 spatial applications. Although incredibly simple, one such interesting application for historical research is Google Earth's photo overlay feature. All it takes is an old map or aerial photograph and some free time, and you can begin to click and drag your way into comparing historical imagery with something a bit more up-to-date. For a couple different reasons, I've been playing around with this feature quite a bit lately, mostly in analyzing urban development in Floatingsheep's North American home base of Lexington, KY. The following image is something I put together for some research my partner Emily has been doing on urban renewal in downtown Lexington. 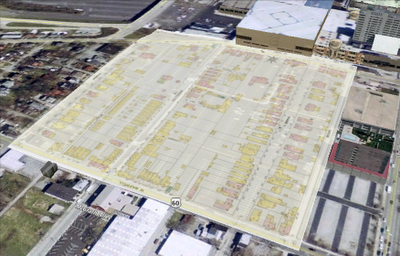 The map shows a Sanborn Fire Insurance Map from 1909 overlaid on the area around Rupp Arena in downtown Lexington. In the late 1970s, a 16-acre neighborhood full of predominantly poor, black residents was demolished in order to make way for the parking lot that now sits across the street from the Lexington Civic Center and Rupp Arena, where the University of Kentucky plays its basketball games. And while a simple overlay can't tell the full story of urban renewal in Lexington, such a visualization is helpful in understanding just how much was lost in this particular case . 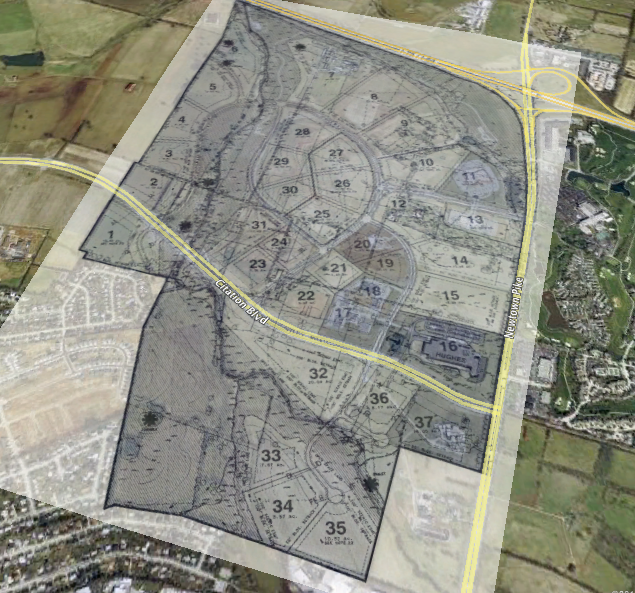 For my master's thesis research, I've used an old development plan for the University of Kentucky's Coldstream Research Campus to visualize just how much the plans for the campus have (not) been realized. Even though an exact date for the development plan isn't available (I've dated it somewhere between 1993-1996), it's possible to see just how little has actually been built at Coldstream in that time . While these are two pretty basic examples that can't be totally divorced from the larger research projects they are a part of, they show the power of using web 2.0 spatial applications like Google Earth for other projects, especially those that have a historico-geographical element. Got any other good examples? Feel free to share them in the comments! It should be noted that the neighborhood likely experienced some degree of change in the intervening 70 years. The point, however, remains. Similar to the above note, the current Google Earth imagery for Lexington is incredibly out of date, circa March 2002, and several more buildings have been built at Coldstream since that time. Again, however, this does not refute the point at hand. OK, perhaps not the largest marker of success but we did beat out floating shelves which are fairly nifty. And there is much stiffer competition for the letter "f". It may take us awhile. 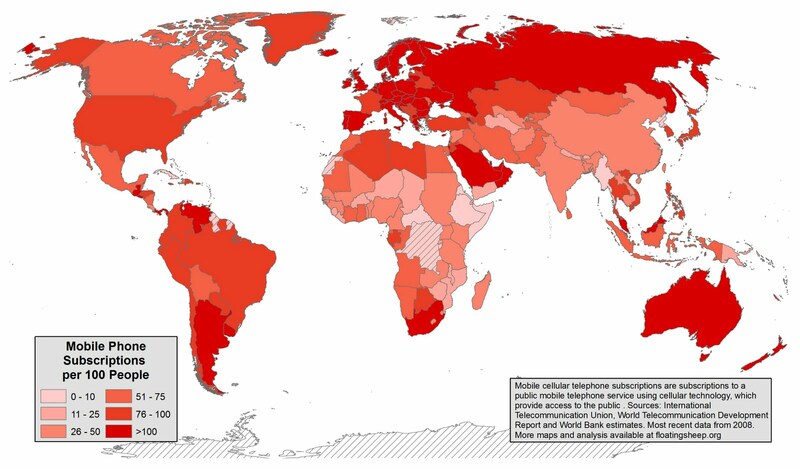 Using World Bank and ITU data we've drawn up the below map of mobile phone subscriptions per 100 people. You'll see that unlike maps of internet penetration rates, there is not an obvious correlation between the wealth of a country and ICT usage. Some relatively poor countries like Ukraine and South Africa have over 100 subscriptions per every 100 people. In contrast, some wealthy countries like Canada and France have relatively low mobile subscription rates. One of the most interesting facts that this map reveals is that despite the significant impacts that mobile phone has had in China and India (there are 1.5 billion mobile subscribers in both countries alone), there remain hundreds of millions of people in both countries that still lack access. However, perhaps most eye-opening is just how many people do have access to mobiles. There are now over 5 billion mobile phone connections worldwide. While much work still needs to be done to connect those who desire connections, a majority of the world's population have access to a tool that has been shown to make an enormous difference to how we communicate, interact, trade, play, love and learn. Mark Graham and Bernie Hogan are hiring a part-time Research Assistant to work on our Wikipedia mapping project. Details are below. Please forward widely and get in touch if you have any questions. We are a leading international research and policy Institute looking for a part-time (50% FTE) Research Assistant to work on a range of programming and database administrative tasks on a Wikipedia-related research projects with Drs Mark Graham and Bernie Hogan. The current offer is for a half time position with a likelihood of expansion to full time, funding permitted. The research will involve a substantial array of computer science skills applied to questions of social science interest. The application does not necessarily need to have social science training, but should be interested in how contemporary technologies can address new and novel research questions. This part-time post (50%FTE) is available immediately for 12 months in the first instance, with the possibility of renewal thereafter funding permitting. Some flexibility over the number of hours worked per week may be possible. The closing date for applications is 12:00 GMT on Thursday 27 January 2011. Interviews are currently planned for Monday 7 February 2011. Have you enjoyed the maps and research we’ve generated at the FloatingSheep blog? Interested in the how the Internet and Geoweb is helping to shape our use of space and places? Would you like to explore your own specific questions related to these topics? How do we understand the impact of new data sources, new actors and changing authority behind maps? How do online social networks blend with material space? 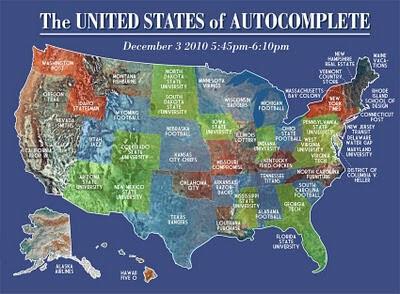 What does near ubiquitous geodata means for privacy/surveillance, power and democracy and the spatial organization of our economies? Is spatial thinking becoming a basic educational requirement and how is it incorporated into humanities, social sciences and natural science? What is the role of code/software on visibility in the Geoweb? You can check out some of the academic publications related to floating sheep and a broader range of my own research. In addition to myself, the department is hiring two additional faculty members (names to be revealed shortly) who are both doing cutting edge work in this area. In short, it is going be a really exciting place to do this kind of research. Students admitted to the graduate program receive full tuition waivers and stipends in exchange for working as teaching assistants. Fellowships and other funding is also possible. More information on the application process is available here. Applicants should submit their materials by January 15 (I should have posted posted this earlier!) to ensure a complete review. If you are interested it would be best to submit by then BUT applications are possible after this date. Just be sure to let me know that it is in progress so I can keep an eye out for it. If you are interested (or want more information) please email me. We had a couple of requests to index all our recent Santa posting and as we're always happy to recycle material, here is a handy listing of all twelve of the 2010 Santa Claus related postings. Enjoy! Part III: A new Holy Roman Emperor?